Dr Shu Kee (Raymond) Lam, a Research Fellow in Climate Change and Biogeochemistry in the School of Agriculture and Food, has received an ICM Agrifood Award from the Australian Academy of Technology and Engineering (ATSE). The ICM Agrifood Award recognises and acknowledges the outstanding work of early career scientists or technologists who have achieved substantial peer or industry recognition for their work in a field critical to continued improvement of the overall Australian food sector in the past five years. Dr Angela Van de Wouw, a Senior Research Fellow at the University of Melbourne’s School of Biosciences, also received an ICM Agrifood Award for her work to help famers manage canola blackleg disease. Higher levels of atmospheric carbon dioxide are impacting agriculture and food security in Australia and worldwide. Dr Lam is tackling this issue from the perspective of soil nitrogen management. Since completing his PhD almost six years ago, Dr Lam has worked on research which has shown under the elevated carbon dioxide levels the atmosphere is expected to reach this century, crops will require more nitrogen to be available in the soil to maintain yields and grain protein content. 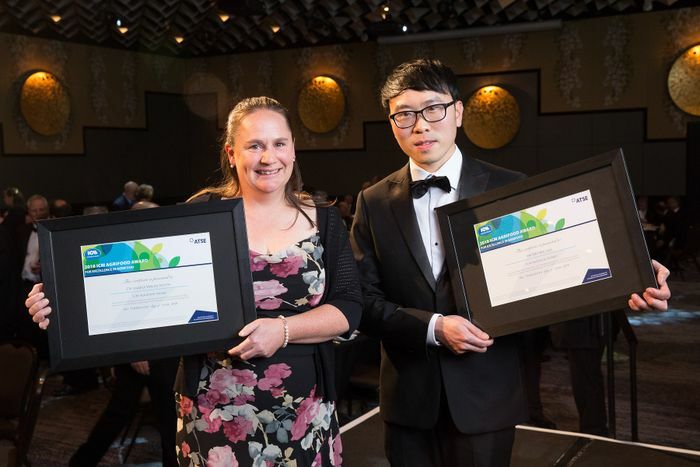 Dr Shu Kee (Raymond) Lam (right) and the School of BioSciences' Dr Angela Van de Wouw (left) received ICM Agrifood Awards for substantial peer and industry recognition of their work in agriculture an food in the past five years. Nitrogen fertilisers are typically used to fulfil crops’ need for the nutrient, but a large part of the nitrogen they contain is lost to the environment when nitrogen compounds leach into waterways or are synthesised by natural processes into nitrous oxide, a powerful greenhouse gas. Mitigating these side-effects is an ongoing research focus for Dr Lam. His current projects include investigations into the effects of nitrification and urease inhibitors, chemical compounds that reduce nitrogen loss to the environment. These can provide environmental, agronomic and economic benefits by increasing the efficiency of nitrogen fertilisers and reducing direct greenhouse gas emissions, but a recent paper by Dr Lam in Global Change Biology showed that nitrification inhibitors could also lead to increased indirect greenhouse gas emissions. "Our results indicated the beneficial effects of nitrification inhibitors can be weakened, negated or even reversed by the associated increase in indirect nitrous oxide emissions," he says. "This is often neglected when evaluating the use of nitrification inhibitors as a climate change mitigation option." The paper was selected by the European Commission (Environment) to inform 20,000 policymakers on developing nitrogen use policy in agriculture. The complexity of the transfer of nutrients like nitrogen can make measuring the environmental impacts of agriculture challenging. Dr Lam is also applying 'big data' approaches to the nitrogen cycle to improve this. He has conducted several pioneering meta-analyses using national and international datasets on agricultural research. Then end-goal will be to develop decision support tools to assist growers in maximising productivity and profitability while minimising damage to the environment. "At the moment there is no evidence-based index to compare, for example, whether vegetables grown in Australia are ‘greener’ than vegetables from China, or beef from Australia versus beef from the US," he says. "We are using big data to work towards a sustainability index, which we believe will provide producers and policymakers with tools to measure the sustainability of agricultural production. "This sustainability index will help people to understand how much reactive nitrogen is released into the environment per unit of agricultural product, and to facilitate an environmental cost calculation which could lead to the development of environmental credit to reward more sustainable producers." Last year Dr Lam secured an ARC Linkage Project with industry partner Incitec Pivot Fertilisers to develop more efficient fertilisers; in 2015, he won the Thomas Davies Research Grant for Marine, Soil and Plant Biology by the Australian Academy of Science for research in overcoming reduction in cereal grain protein under elevated carbon dioxide; and in 2010, Dr Lam won the prestigious International Plant Nutrition Institute Scholar Award. ICM Agrifood Award winners each receive a cash prize of $5000, sponsored by ICM Agribusiness, one of Australia’s major agribusiness groups. The awards are administered by ATSE. Dr Angela Van de Wouw is a senior research fellow at the University of Melbourne’s School of Biosciences. She has published more than 36 papers and is internationally recognised as a leading expert on canola blackleg disease, a devastating canola disease that almost wiped out the industry in the early 1970s. She discovered new ways to control blackleg including identifying blackleg-resistant genes, creating molecular tests to predict disease outbreaks and developing disease management strategies. Using a 'genome to paddock' approach, she has effectively armed farmers with management options to protect their crops and – working closely with breeders, industry personnel and researchers – has prevented crop losses worth millions of dollars each year. The impact of her innovative research has been felt beyond Australia, playing a critical role in overcoming trade restrictions with China. After fears of blackleg contamination, Dr Van de Wouw’s research helped reopen the Chinese market to Australian canola imports in 2013. The awards were presented by Professor Lindsey Falvey, Chair of the Board of the International Livestock Research Institute and a former Dean of Land and Food Resources at the University of Melbourne. "It is wonderful to see two very high-calibre young scientists recognised and lauded for the wonderful research and its impact in industry," Professor Falvey said. "The insights delivered by their research has already led to significant practical on-farm and industry outcomes for the benefit the broader Australian agrifood industry." ATSE President Professor Hugh Bradlow said Dr Van de Wouw and Dr Lam were making a significant contribution to the application of technology for the benefit of Australian society and its economy. The ATSE is an independent body of 870 eminent Australian scientists and engineers enhancing Australia’s prosperity through technology and innovation.